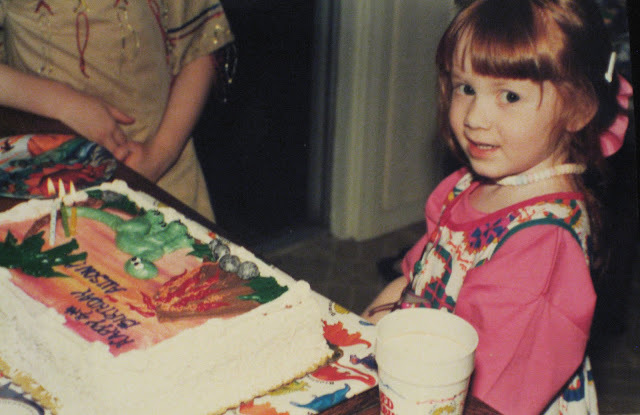 My love of baking started when I was a small child. I don't have any prominent early memories of my mother baking anything but my exploits in our backyard say otherwise. Our first family home was in a quiet, wooded cul-de-sac in Sammamish, Washington. Along the side of the house were our recycling bins and I would root through them carefully, pulling out the much prized Marie Callendars individual pot pie tins and glass jam jars.Tools in hand I would set to work on my culinary creations. Recipes were usually mud based, with additions like gravel (chocolate chips), flower petals (sprinkles), and bits of twig (for fiber?). I'd mix everything together, stealing water from the hose and flowers from my mother's garden. Pour everything into the pie tins and set on a rock in the sun to bake. Jam jars were usually filled with hose or rainwater and whatever colorful flowers and pretty rocks I would find to make magical love potions. My friend Dana and I would create these potions in hopes that some boy would decide to drink one against his better judgment. Smartly, I never consumed my outdoor baked goods, but that didn't stop me from trying to sell them to unsuspecting relations. My first foray into real baking would also be with my friend Dana as well as my other two pals Corinne and Susannah. Dana's mother allowed her significantly more freedom than mine so we found ourselves left to our own devices in the kitchen quite a bit. We used a book called the Alpha-Bakery Children's Cookbook by Gold Medal Flour Company - a collection of alphabet themed recipes easy enough for kids to make. The recipe we made the most was the Xtra Special Celebration Cake. The absence of eggs in the recipe made it seem like the easiest cake any of us had ever made. (I did not know how to crack an egg at that age.) Serving ourselves slices of cake we'd baked ourselves felt decadently adult. I can still taste that cake, lightly chocolatey and spongy in the way that only cakes made with vinegar can be. Baking made me feel powerful. Suddenly, I could take seemingly mundane things and combine them to create something delicious. It felt like magic. It still feels like magic.